Blue Cheese Burgers - Headbanger's Kitchen - Keto All The Way! 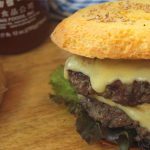 Blue cheese burgers are the third and final recipe for beef week, I mean water-buffalo week here on HK. I started with a recipe for steak with herb butter and then a Keto chilli con carne. It was only fitting that I included a burger on the menu as well. For the hamburger buns we’re using my Keto microwave mug bread recipe. We’ll be cooking the burgers on the stove top and making a delicious secret (not really) burger sauce to go with it. This recipe makes 4 servings/burger patties. Macros don’t include the burger buns and other condiments. They are only for the patties. A delicious beef and blue cheese burger.